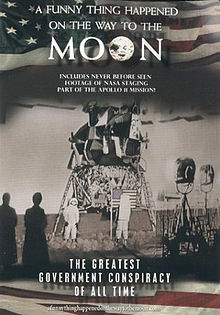 This lunar landing debunking documentary explains why you shouldn’t believe that NASA landed astronauts on the moon. If everything said in this documentary is true, and we round here on the VizFact Dot Com network pride ourselves in being objectively skeptical, then NASA lied about landing on the moon. The number one reason of all time to consider that man never even got close to the moon: The Van Allen Radiation Belt. Learn it my friend. Lethal bands of radiation surrounding the earth requires spaceships to be surrounded by 6 to 12 feet of lead to ensure astronaut survival. We’ve never had physics that would allow the ship to even leave the ground, less known an actual spaceship with such a massive casing. Another point made was that America used to deceit to trump the fact that the Soviet Union had beat them into to space, and this had military implications. So if it was a lie, it was war deception. Everyone had to believe that NASA had went to the moon, even if they couldn’t do it. With 135 billion dollars being invested, results were needed, either falsified or not. As far as the government not being able to keep a secret this large is concerned, The Manhattan Project and the construction of the First Nuclear bomb were cited. Mission control in the fine, fine, mighty fine, city of Houston was said to have been fed false information. All mission information was handled in a compartmentalized way so that only a very few of the higher-ups new the moon landings by NASA was a hoax, and the mission data was a pre-arranged sham. The quality and count of the lunar landing photos were in question. NASA had HD technology back in them days, and the footage that we are all used too, didn’t have to be that grainy. NASA had good cameras. The TV networks complained to NASA about the poor quality of the video and images of the moon landings. they used b&w camera when color technology was the norm. Shadows crisscrossing themselves in the official NASA photos of the moon landings indicate multiple sources of light which is impossible without multiple light sources, and not caused by the sun. this indicates that the landings were in a controlled well lit environment. There were no burn craters under the 10,000 pound thruster in the lunar landing module. There was no dust on the landing gear. Even with no atmosphere, no stars showed up in any of the pictures from the moon. Nor did they take pictures. This doc is sh*t due to the Lunar reconnaissance Orbiter, every site is shown in great detail. This is a huge waste of time don’t bother to watch.